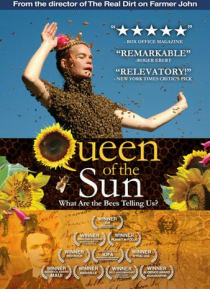 IHG® Rewards Club - Películas - Queen of the Sun: What Are the Bees Telling Us? QUEEN OF THE SUN: What Are the Bees Telling Us? is a profound, alternative look at the global bee crisis from Taggart Siegel, director of The Real Dirt on Farmer John. Taking us on a journey through the catastrophic disappearance of bees and the mysterious world of the beehive, this engaging and ultimately uplifting film weaves an unusual and dramatic story of the heartfelt struggles of beekeepers… , scientists and philosophers from around the world including Michael Pollan, Gunther Hauk and Vandana Shiva.